Albany has been a railroad town since the century before the last one. Residents get plenty of chances to watch trains go by, as I did again on Wednesday at the Burkhart Street crossing for pedestrians and bikes. The train was short, but it still had something to say to watchers like me. The crossing is on one of my bike routes. 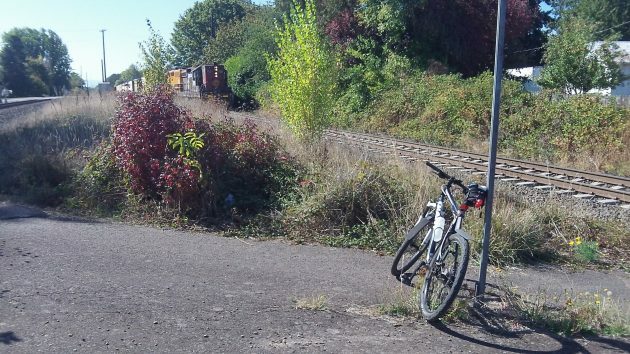 For people on foot or on a bike, it’s a handy shortcut from Salem Avenue to the Willamette Neighborhood, which I count as part of my riverfront beat. There are stop signs at the crossing but not gates on this path. So it is useful to look right and left before crossing the two tracks, the Union Pacific mainline and the one the Portland & Western uses to reach its Millersburg yard and points north. If the train had something to say, what was it? Well, as it happened, that freight you’re watching on the video represented a partial sampling of the output of Oregon’s wood products industries. There were a couple of cars carrying what looked like telephone poles, several cars with milled and packaged wood products, plus a bunch of cars carrying logs. I’m pretty sure the logs were bound for the Columbia River to be loaded on a ship for export to the Far East. A Portland & Western freight approaches the Burkhart Street crossing as it heads for the Millersburg yard. I love railroad stories. What happens to these cars at the Millersburg yard? They are arranged to form longer trains to run on the Portland @ Western system. With nearly 3-billion board feet of Oregon timber cut in each of the most recent years, most of which came from private timberlands, is difficult to see how the timber industry could possibly “be in trouble.” The feeder railroads and the main lines are all filled with lengthy trains loaded to the gunwales with Oregon timber. The fact that avaricious timber and railroad barons can no longer run amuck, strip-mining Oregon’s forests does not trouble me, nor should it trouble anyone. Kudos to Mr. Hering for pointing out the fallacy of disappearing mills. We should be far more concerned with disappearing forests. W&P 1501 is an EMD SD7, built in November of 1952. These were the locomotives that replaced steam locomotives on the Southern Pacific. Too bad they recently disabled the gyrolight. Enjoy this locomotive while you can, there are not many of these locomotives in service anymore.